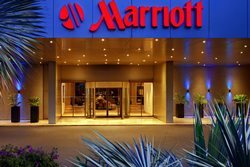 Another week, another data breach, this time concerning Marriott, which could affect up to 500 million of its hotel guests. The Marriott hotel group says its guest reservation system has been hacked, potentially exposing the personal information of approximately 500 million guests. The hotel chain said the hack affects its Starwood reservation database, a group of hotels it bought in 2016 that includes the St Regis, Westin, Sheraton and W Hotels. Marriott said hackers had gained unauthorised access to the Starwood reservation system since 2014, but the company only identified the issue last week. For 327 million people, Marriott says the guests' exposed information includes their names, phone numbers, email addresses, passport numbers, date of birth and arrival and departure information. For millions others, their credit card numbers and card expiration dates were potentially compromised. "The company recently discovered that an unauthorized party had copied and encrypted information, and took steps towards removing it," Marriott said in a statement. Marriott warns that it can't confirm if the hackers were able to decrypt the credit card numbers. It said it will begin emailing guests affected by the breach and has created an informational website.